It’s that time of year again. Can’t you hear the diehard fans chanting “foot-ball, foot-ball, foot-ball”? It’s faint but drumming louder as we approach the final countdown to football season. Are you and your fiancé tailgating king and queen, season ticket holders and fantasy league fanatics? 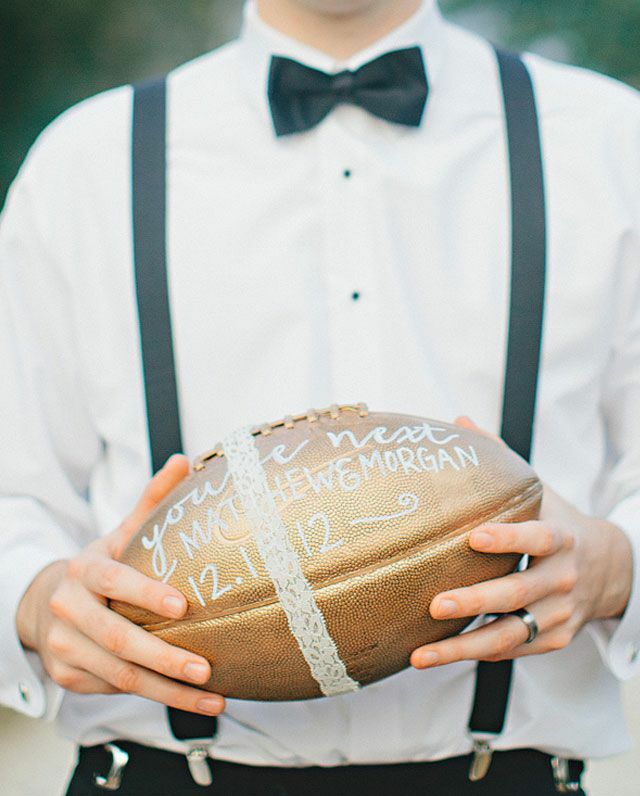 If you’re the couple that bleeds your team’s colors, why not add some spirited touches to your wedding day? 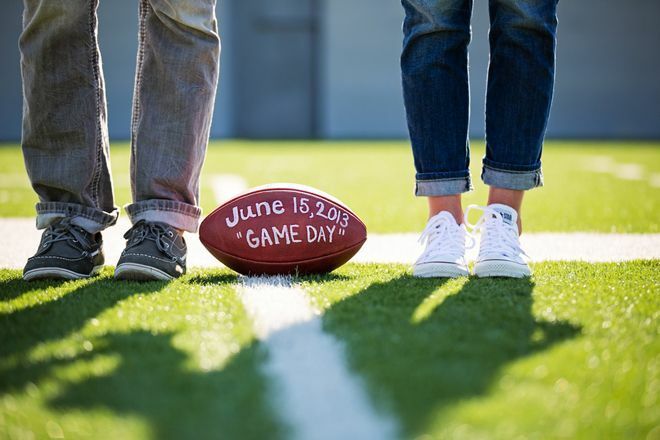 Maybe you played on your school’s football team, maybe you met your future spouse at the same college or maybe you just share a love for the game — whatever the reason, here are some clever ways to incorporate the big game into the big day. CAN I HAVE YOUR AUTOGRAPH, PLEASE? 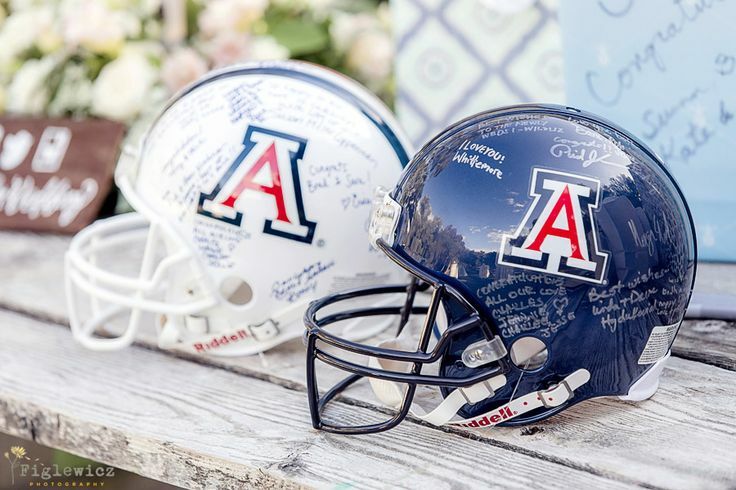 : Ditch a traditional guestbook and go for a signed ball or helmet — too cool! SPIRITED ESCAPE: Swap sparklers, bubbles or rice for festive pom poms in your team’s tones. Bonus: Any other fans of the same team will put them to use for games to come. SHOW-STOPPING STADIUM CAKE: Not feeling the tiered look? 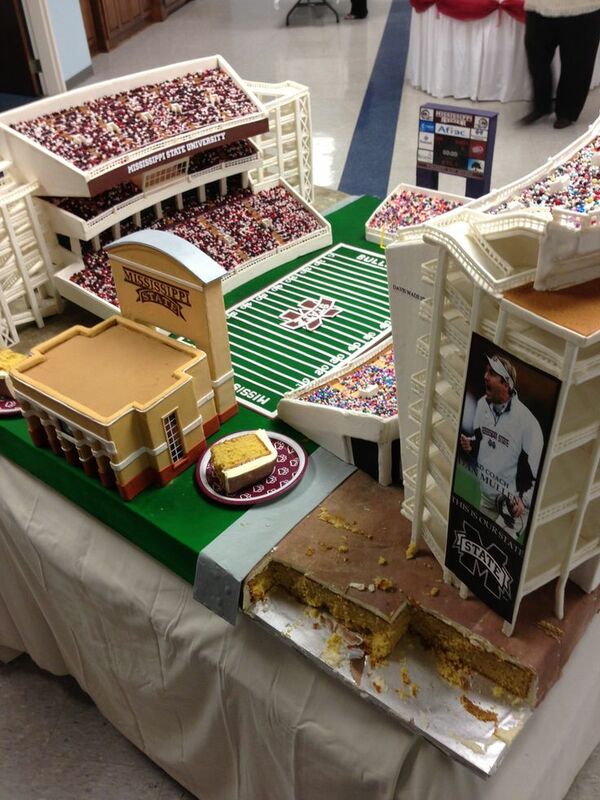 Opt for something truly memorable, like this creation of Mississippi State’s stadium. Or, if your heart is set on a traditional cake, gift this crowd-pleasing cake to the groom/bride as a surprise. SAVE THE DATE SEASON PREVIEW: Cute, simple and memorable, this all-American approach is a winner. FOR THE FIRST TIME…MR. 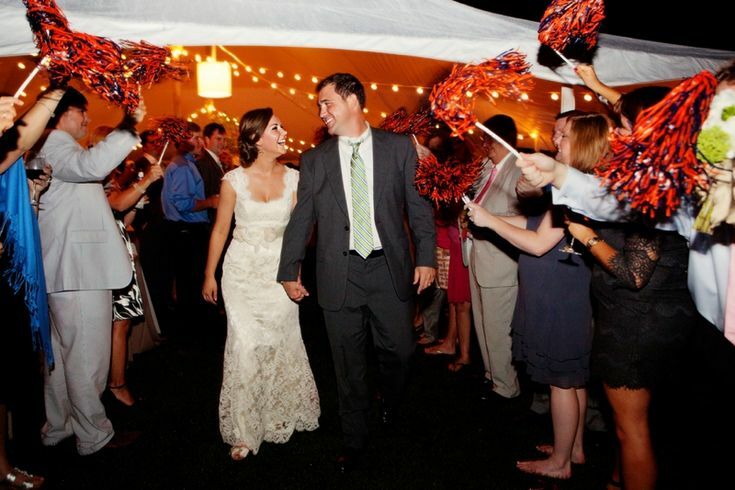 & MRS: Storm the dance floor with an entertaining entrance. 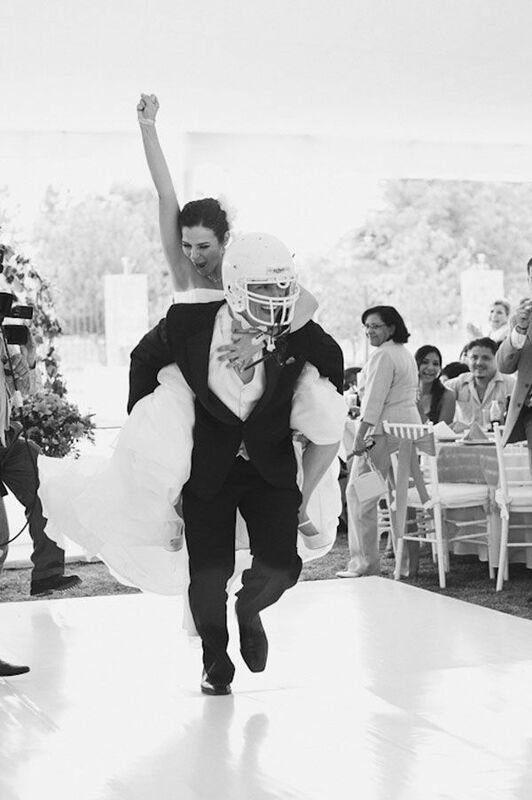 GO LONG: Want to put some spin on the traditional garter toss? 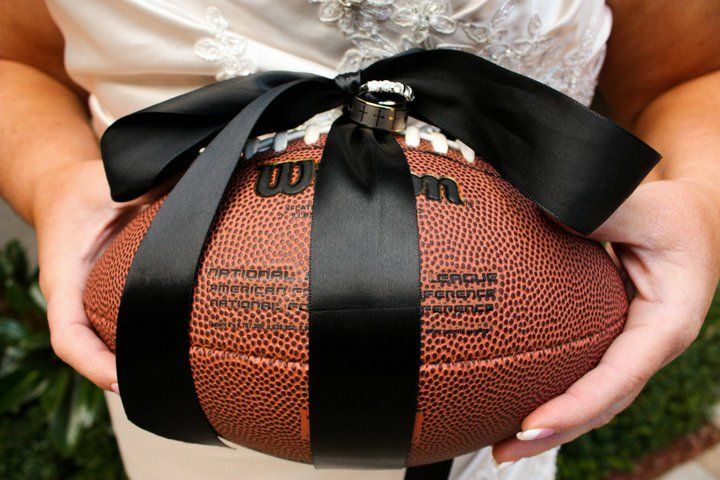 Strap it to a football for a touchdown pass. TO HAVE AND TO HOLD: Lace your rings to a ball for an adorable resting spot.